It’s Green Bay Week at The MMQB: Our staffers are embedded for a game week, doing a deep dive into the NFL’s most tightly knit community. We’ll explore the dynamic between the players and the people of Green Bay and provide a glimpse into what makes it a bucket-list destination for football fans. Follow on Twitter for updates, Facebook for live streams, and Instagram for our “Humans of Green Bay” project. An NFL tradition like no other started in 1993, when Packers safety LeRoy Butler scored a touchdown and celebrated by spontaneously jumping into the stands. Since then, every Packers player has looked forward to taking his own Lambeau Leap, a rite of passage so revered that it remains untouchable during an era in which the excessive celebration penalty flags get thrown around like parade candy. But the Leap isn’t as simple as it looks. Misjudge your timing by a hair and you’ll find yourself desperately climbing the wall, legs flailing, and praying that the fans above you are strong enough to hoist you up. And if you do mess it up, your blooper reel will be shown in team meetings throughout next week for every teammate to critique your effort. Donald Driver had plenty of opportunities to hone his leap, having scored 28 touchdowns at Lambeau. We talked to current and former players about how it should be done. 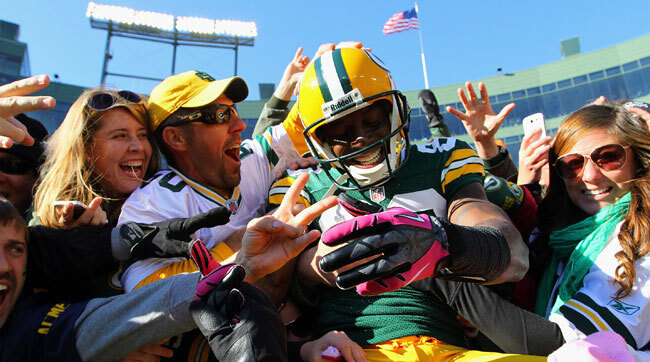 Mike Daniels shows less-than-perfect form on his firm Lambeau Leap. Aaron Rodgers take the plunge in October 2010. Richard Rodgers needed some help for his playoff TD leap in January 2015. Eric Walden surrounded by sudsy fans, December 2010. Donald Lee feels the love, November 2007.